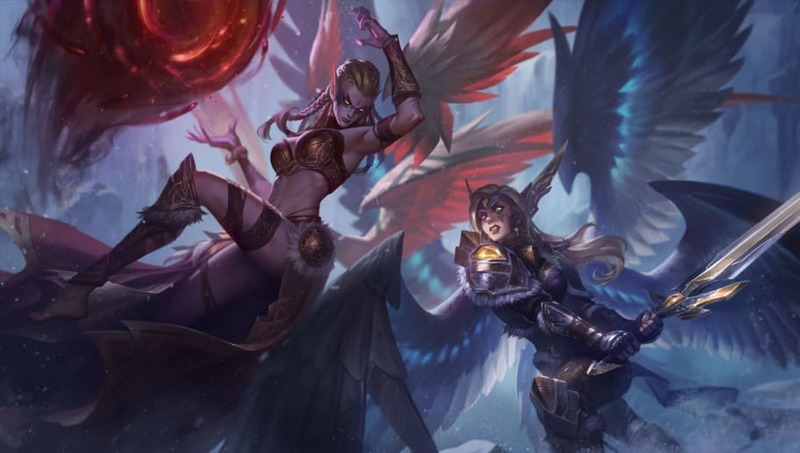 Kayle rework and Morgana rework will go live in League of Legends Patch 9.5, which goes live Wednesday. The reworks include substantial visual makeovers for both ​League of Legends champions, new lore retooling their shared backstory, re-recorded voice work, and partial to full kit redesigns. Check out the detailed stats below. Level 1 - Zealous: Basic attacks increase attack speed by 6 percent for three seconds, stacking up to five times. At max stacks Kayle becomes Exalted, gaining 15 percent movement speed toward enemy champions. Level 6 - Aflame: Exalted attacks launch fire waves that deal 10/15/20/25/30 (plus 20 percent AP)(plus 10 percent total AD) magic damage. Level 11 - Arisen: Attack range is increased to 550, Exalted attack speed per stack is increased to 10 percent. - Kayle summons a celestial sword that stops on the first enemy hit. The sword deals 70/115/160/205/250 (plus 50 percent AP)(plus 60 percent AD) to the target and enemies behind it, slows by 26/32/38/44/50 percent for two seconds, and shreds armor and magic resistance by 20 percent for three seconds. - Active: Kayle's next attack becomes ranged and deals 10/12.5/15/17.5/20 percent of the target's missing health as bonus magic damage. This attack upgrades when Kayle reaches Level 6, causing it to explode when it hits the target, dealing damage to nearby enemies. - Morgana chains herself to nearby enemy champions, dealing 150/225/300 (plus 70 percent AP) magic damage and slowing them by 20 percent. - After 3 seconds, enemies unable to break the chains take an additional 150/225/300 (plus 70 percent AP) magic damage and are stunned for 1.5 seconds. - While casting Soul Shackles, Morgana gains 5/30/55 percent movement speed towards enemies she has chained. League of Legends Patch 9.5 also brings a pair of new skins and balance changes for several other champions in both Summoner's Rift and ARURF.